One of the most blood-soaked battles in Irish medieval history took place on August 19, 1504, at Knockdoe, a hillock in County Galway. It would prove to be one of the last old-school medieval infantry battles in the region. At the same time, a couple of battle-field game-changers were implemented during this fight as well. It all began with Gerald Fitzgerald, the 8th Earl of Kildare, feeling the need to prove his loyalty to King Henry VII of England. He was already Henry’s guy in Ireland, but a grand gesture here and there never hurt, especially since Fitzgerald hadn’t always been the most trust-worthy of servants in the past. The King put up with it because he knew the Earl was quite adept at keeping the Irish under control without being too heavy-handed and causing inconvenient uprisings. Ulick Burke of Clanrickard was unimpressed with the Earl’s power. He captured three castles in the south of Galway belonging to the O’Kelly family and took control of the royal city of Galway in direct opposition to the Great Earl’s authority. To muddy the waters even further, Burke was married to the Earl of Kildare’s daughter Eustacia. The story is that Ulick had strayed from the marital bed, and the Missus went home to Daddy. So there was a big jumble of political and personal bad vibes thrown in the mix. All of Burke’s actions were ample cause for the Earl to take action against him. This would allow him to avenge his daughter, take Burke down a peg or two, and make himself look good to the King in one fell swoop. He gathered a formidable army, including mercenary Gallowglass warriors, Gaelic fighters reminiscent of Vikings, who came from the Hebrides in Scotland. These warriors-for-hire would dominate the battlefields of Ireland in the Middle Ages. To the Earl, the battle was a suppression of rebellion against the King across the sea; to Burke, it was more akin to the old battles between the provincial kings before the English arrived in Ireland. In reality, it was a mixture of both, but it was still the Irish fighting the Irish to settle old scores. Burke came to the battle with about 4,000 men, (he also made use of the Gallowglass fighters) roughly 2,000 less than the Earl. They also had to cope with the disadvantage of having the morning sun in their eyes. Even still, Burke showed up to the battle fashionably late in true Celtic chieftain fashion. 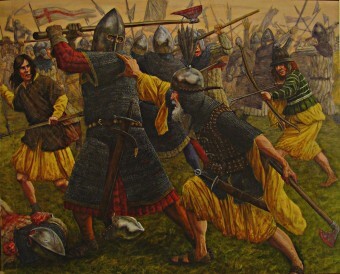 The battle was a gory slash-and-hack job in true medieval fashion, but there was one modern weapon used at Knockdoe (renamed Axe Hill after the bloody battle that took place that day) – the handgun. They were used in a major battle for the first time in Irish history that day, but since they took so long to reload, their primary use on the field was as bludgeons. When the battle din had silenced, there was a seemingly endless stretch of mangled and dismembered bodies, broken spears, and shattered shields all lying in hideous pools of gore. While the number of deaths is not certain, it is thought to have been in the thousands. Amazingly, the author of this article failed clearly to tell readers which side won the Battle of Knockdoe! The forces of the Earl of Kildare were victorious.